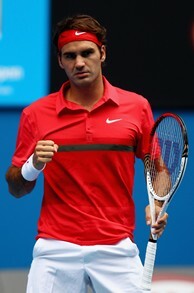 Roger Federer has won four Australian Open titles. MELBOURNE, Australia -- The endless debate as to whether Roger Federer's negative 9-17 record against Rafael Nadal has more to do with surface than the Spaniard's ability to exploit his weaknesses and get into his head may go on forever, but on Thursday night, when the two great rivals meet in the semifinals of the Australian Open, at the very least, their two groups of rabid fans can at least concede that the slow hard court in Rod Laver Arena is a fair test of both their skills. Federer enters the match-up with a 5-4 record against Nadal on cement but lost the most important match of them all - an unexpected 7-5, 3-6, 7-6 (3), 3-6, 6-2 loss in the 2009 Australian final, which had come just after Nadal's record five-hour, 14-minute victory over Fernando Verdasco in the semifinals. It was the Spaniard's first Grand Slam title on a hard court and gave him enough confidence to be able to storm into the US Open in 2010 and grab that title, which gave him at least one title at all four majors (Federer has also accomplished the same). But that was three years ago, and a fair amount has changed since then: 16-time Grand Slam titlist Federer has not won a major since the 2010 Australian Open, when he bested Andy Murray in the final; and Nadal entered the 2012 season questioning himself more than he ever has before after No. 1 Novak Djokovic took him out in six 2011 finals, including three times on hard courts at Indian Wells, Miami and in a huge physical struggle at the US Open. While Nadal thumped Federer on hard courts in Miami and in the 2011 Roland Garros final on clay, Federer overwhelmed him on a quick indoor hard court at the ATP Championships in London. On too many occasions, like in his 6-7 (6), 7-6 (5), 6-4, 6-3 win over Tomas Berdych on Tuesday in the Aussie quarters, Nadal found himself camped a good seven feet behind the baseline retrieving. While he can still rip winners from way off the court, he can also be successfully attacked, which is what Berdych did before the world No. 2 got comfortable and began to push himself forward. "I think I finished the match playing at one of my best levels on this kind of surface, returning inside the court, making a lot of winners from with the first ball, the return, having serve, and winner," Nadal said. "So that's something that I really miss a little bit, especially second part of the season last year. The first part of the season was positive, but winning with a different way, not that way. So most important thing, too, is the character. How I acted on court was completely the right one tonight. For moments at the second half of the season last year wasn't. Was not the perfect one. Today was the perfect one." In a sense, that's a warning shot to Federer. A dispirited Nadal like the one he faced in London can be had anywhere, but a Nadal who believes that someone will have to go up and over the wall to beat him is nearly impenetrable. The left-handed Nadal's heavy topspin forehand, slice and kick serve numb the Swiss' backhand, and Nadal has said in the past that if he can keep Federer pinned behind the baseline long enough, that the Swiss can get frustrated and attempt a high degree of difficulty shots. But despite his increasing age, Federer has continued to try to improve and actually looks like he has over the past five months. He is currently on a 24-match winning streak that dates back to his loss to Djokovic in the semifinals of the US Open, a contest where he held two match points and might have reached the final if not for a couple of extraordinary forehands from the Serbian. After he left New York, he traveled to Sydney, Australia, and scored two Davis Cup wins over Lleyton Hewitt and Bernard Tomic. He then won titles in Basel, the Paris Masters and the ATP World Finals. In Melbourne, he battered the very capable likes of Tomic and 2009 US Open champion Juan Martin del Potro in the last round. Under his coach of the past 13 months, Amercian Paul Annacone (who once coached Pete Sampras), Federer has begun to flourish. His first serve has become a major weapon again, as he has begun to hit the corners. He is taking more risks on his return game by taking balls more on the rise, and he no longer dismisses net charges as an element of his game that he does not really need. His statistics during the fortnight have been remarkable: he has won 83 percent of his first-serve points, has placed back 71 percent of his opponents' serves, and won 61 of 90 points at the net. Overall, Nadal owns a 17-9 record against the Swiss, but if Federer can avoid falling into the Spaniard's push-and-pull routine, control the court with his own awesome forehand, serve with power and efficiency, keep the points fairly short, and have the Spaniard guessing, he has a good chance at victory. But if Nadal manages to make the contest a marathon cage match, the Swiss will be in huge trouble. "I'm moving well," Federer said. "I'm serving well. I'm hitting the ball clean. I feel like it's been a quick week for me, and I feel great." For Federer's sake, hopefully he will not revisit his 2009 nightmare, when during the Aussie Open trophy presentation, he broke down in tears and uttered the now famous phrase: "God, it's killing me." A fifth Aussie Open title and tears of joy would be much more satisfying.